Kiwi cuisine... have you heard of it? It's actually a slang term to describe the cuisine of New Zealand. Last night, friends and I got together for a wine dinner highlighting Kiwi cuisine paired with New Zealand wines. This potluck dinner included some great dishes and really opened my eyes to both the food and culture of New Zealand. My contribution to the table included this dish for a meat and potato pie. 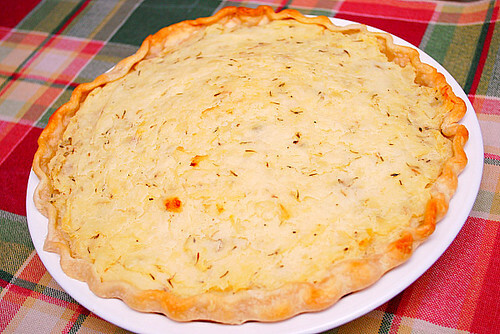 Potato pies are a favorite in Australia and New Zealand. Similar to 'shepard's pie,' this savory dish involves a savory meat filling that's placed in a pie crust shell and topped with creamy mashed potatoes. The original recipe was prepared as individual pies however I adapted the recipe to make one single pie making it great to serve family style. The dish went well with the other potluck offerings and from what my guests said, this meat and potato pie was especially delicious with a New Zealand Sauvignon Blanc! Heat the oil in a skillet over medium-high heat. Add the onion and saute for 3-4 minutes or until soft and translucent. Add the sliced mushrooms and saute until caramelized, about 5-7 minutes. Add ground beef and cook for 3-4 minutes, stirring and breaking up with a wooden spoon until browned. Combine cornstarch and 1 tablespoon of beef stock and stir well. Set aside. Add remaining beef stock, Worcestershire sauce, and tomato paste to the beef mixture. Stir well to combine. Add cornflour mixture and stir. Bring to the boil. Reduce heat to low and simmer for 10 minutes or until thick. Remove from heat and cool. Place potatoes in a large, heavy saucepan. Add enough cold water to fully cover the potatoes. Bring to a boil. Reduce heat and simmer, partially covered, until potatoes are tender, about 10 to 15 minutes. Drain the potatoes in a colander, then return to pan and add the sour cream, butter and dried thyme. Mash until smooth and creamy; season with salt and pepper to taste. Set aside to cool. Prepare a pie plate by placing the pre-made (or homemade) pie crust in the pan and crimping the edges. Fill the pie crust with the cooled beef mixture. Top with the cooled mashed potatoes and smooth out to cover completely. Brush the edges of the pie with the beaten egg. Place the pie on to a baking sheet and bake in the preheated oven for 20 minutes or until the potato filling is slightly golden. Serve warm or at room temperature. Shepherds pie is THE BEST. Most Mums make it without a pie crust, just chuck all the cooked filling into a roasting dish, cover with mashed potato and cheese and bake/grill. Isn't it amazing how something so simple and, lets be honest; a bit hopeless, can be so good?! Where exactly does the beaten egg come in?